Note: The analysis devices listed below are completely configured and available with short delivery times. Furthermore, countless device configurations - even customer-specific configurations - can be delivered on request. Our regional sales organization will be glad to advise you on which device configuration is best for you. 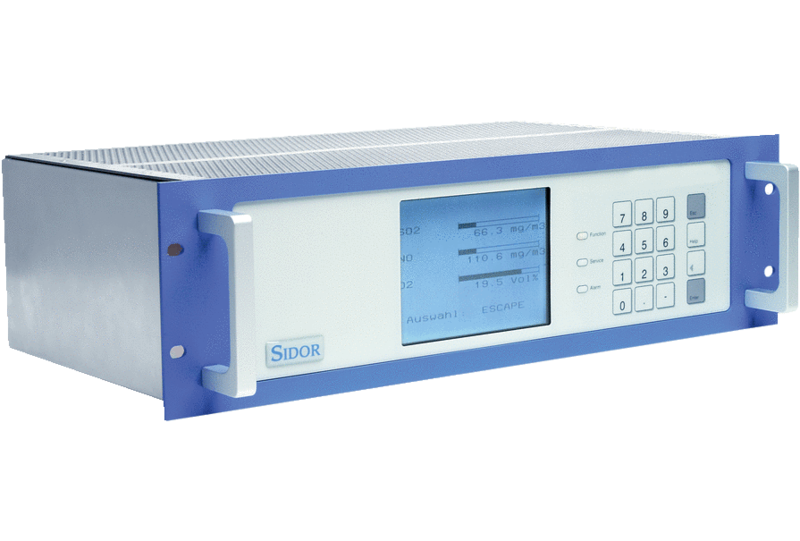 The SIDOR is a gas analyzer for measurement of up to 2 infrared components. Additionally oxygen can be measured by integration of an electrochemical or paramagnetic measuring cell. A significant characteristic is a half-yearly maintenance interval with test gases. The stability of the measuring cells allows an adjustment with only inert gas or ambient air within this half-year period. Sample gas pressure compensation is included as a standard. The SIDOR was type approved for large combustion plants and crematories.